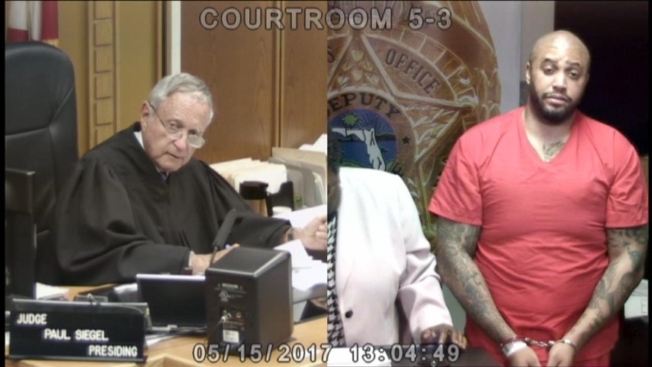 'Straight Outta Compton' actor Richard Taylor appears in bond court after his arrest in Miami-Dade on asault charges. The actor who played rap mogul Suge Knight in the 2015 movie "Straight Outta Compton" was arrested early Monday for allegedly assaulting a security guard at a Sunny Isles Beach hotel, Florida police said. According to a police report, a uniformed security guard at the Marenas Beach Resort on Collins Ave. approached 40-year-old Richard Taylor and asked him to take his feet off of a table in the hotel's lobby. When Taylor refused, the guard asked front desk staffers to call the police. A few minutes later Taylor allegedly approached the guard, shoved him several times and a fight ensued. Responding officers arrived at the hotel just before 11:30 p.m. Sunday night and, according to the report, witnessed Taylor "pick the victim up and slam him to the ground." Taylor was arrested and charged with battery. He appeared in court Monday was given a reduced bond of $750. Taylor played the role of Death Row Records co-founder Marion "Suge" Knight in the story of the 1980s hip-hop group N.W.A., which included such members as Dr. Dre, Ice Cube and Easy-E. Knight is currently in jail awaiting trail on a murder charge. Taylor lists himself as an actor, stuntman, fitness trainer and martial arts instructor, according to his IMDB page.